This article contains facts and information about the life and times of the famous Native American Indian chief known as Metacom (King Philip). Who was Metacom, aka King Philip, and why was this Native Indian chief famous? 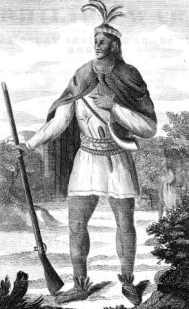 Summary: King Philip (1638-1676) was famous as an Wampanoag Indian sachem and chief of a confederation of Algonquian tribes. Pilgrims broke a peace treaty and in 1675 this subsequently led to a bitter conflict with the colonists known as King Philip's War. He was killed on August 12, 1676 and his body was beheaded and quartered, and his head was displayed on a pole for 25 years at Plymouth. The following fact sheet contains interesting facts, background history and information about the life of Metacom and the events in history that led to his fame as a great Native American Indian leader. Title: The tradition of crowning a Native American Indian chief as a king started in 1608 when Chief Powhatan, the father of Pocahontas, was crowned as a king. The peace was shattered in the first half of 1675 when the affair of John Sassamon, whose Indian name was Wassausmon, occurred. John Sassamon was an educated Native American Indian who had returned to the Wampanoag tribe, after being converted to the Christian religion. He spoke English, and was used by Metacom as and interpreter and secretary. John Sassamon believed that he had discovered Wampanoag war plans, and he carried the secrets to the Plymouth colony. His treachery was discovered and in March 1675 his body was discovered under the ice of a pond of Plymouth Colony. His neck had been broken as a legal execution that had been ordered by the sachem. The colonists arrested three of Metacom's men who tried in court before a jury of twelve colonists and five Indians. They were found guilty and put to death. Metacom was incensed by the executions which he believed was as an encroachment of his tribal authority. The betrayal by John Sassamon, and his subsequent murder, antagonised both the Native Indians and the colonists. In June 1675 the conflict known as King Philip's War began when on June 20, 1675, Metacom mounted a sudden raid on the English border settlement of Swansea. The war involved the New England colonies and the confederation of the Wampanoag, Narragansett, Nashaway, Nipmuck and Podunk tribes. Metacom was joined in the leadership of the confederation by Canonchet, the chief of the Narragansett and Muttawmp, the chief of the Nipmuck tribe. The colonists retaliated and attcks were ordered on other settlements including major attacks on the Plymouth colony. On March 26, 1676 the setttlement of Providence was completely destroyed. In May 18, 1676 Captain William Turner of the Massachusetts Militia led 150 men against the Narragansett tribe and their chief, Canonchet, was killed. During the remainder of the summer other Native Indian defeats prompt the surrender of some tribes allied to Metacom (King Philip). Metacom's wife and son were captured and imprisoned (they would later be sold into slavery). On August 12, 1676 Metacom (King Philip) was betrayed by a Native Indian informant in the service of Captain Benjamin Church who revealed the chief's hiding place at Mt. Hope in Rhode Island. He was killed in the ambush and his body was then beheaded and quartered. The head of Metacom was displayed on a pole for 25 years at the Plymouth colony. For additional facts and information refer to the legend and the Story of Metacom (King Philip). Metacom (King Philip). Discover the vast selection of pictures on the subject of the tribes of Famous Native Americans such as Metacom. The pictures show the clothing, war paint, weapons and decorations of various Native Indian tribes, such as the Wampanoag tribe of Metacom, that can be used as a really useful educational resource for kids and children of all ages studying famous Native Americans such as Metacom. We hope you enjoy watching the video - just click and play - a great educational resource for kids.